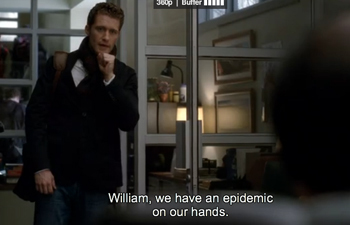 Hulu has been a pioneer online, offering closed captioning for TV shows such as "Glee." When “The French Chef” appeared on PBS in 1972 with captions, it marked the first TV show ever to be fully accessible to the deaf and hard of hearing. For the next decade, people with disabilities enjoyed more and more captioned TV, culminating in a 1990 law that required all TV shows to be captioned. Fast forward to today. When viewers tune in on their computers — now the fashionable way to watch TV and web programming — most of the shows are not captioned. Not even “The Annoying Orange,” which is the No. 1 webisode series, garnering more than 50 million monthly views on average — more traffic than for some cable channels. As consumers achieve greater freedom in how and where they watch movies, it is increasingly important that Americans with disabilities are able to enjoy this programming with them." Just when the “legacy” TV and cable industry began getting into the captioning groove, accessibility seems to be moving backwards. With the rise of the Internet, video content is now moving online to meet the demands of always-on consumers — and the captioning technology, standards, and processes must begin anew. New types of programming — like “The Annoying Orange” webisodes — are growing in popularity, but making them accessible for people with disabilities has been a low priority. That’s a serious issue for the millions of hearing- or vision-impaired Americans. In the U.S., there are 25 million people with significant vision loss, and 36 million Americans have reported some form of hearing loss — a number that is expected to double by 2030. There are now 75 million Baby Boomers who will encounter vision, hearing, cognitive and mobility disabilities as they age, and more than 1 million veterans returning home from a decade-long war — many with physical and mental conditions. As consumers achieve greater freedom in how and where they watch and listen to movies, dramas, sitcoms and sports, it is increasingly important that Americans with disabilities are able to access and enjoy this programming along with them. The good news is that President Obama signed the Twenty-First Century Communications and Video Accessibility Act into law on October 8, 2010, marking a tremendous step in the right direction for these groups. This law amends Federal Communications Commission (FCC) policies to require that any program that has been previously aired on TV must be captioned when shown online. However, the FCC only has the power to regulate broadcast, cable, and satellite TV providers. The lion’s share of emerging programming is not covered under the new law and will not be captioned or described for people with hearing and vision disabilities. This includes hundreds of hours of online-only programming like popular webisodes (yes, including “The Annoying Orange”), YouTube videos, podcasts, and movies from Netflix, which now offers streaming TV shows and movies online and through devices like iPhones and PlayStation consoles. Recently, the Department of Justice has been looking closely at the issue of accessibility, and is considering stepping in where the FCC’s jurisdiction ends. The DOJ can amend the Americans with Disabilities Act to require websites to make their content accessible. That would be a heavy-handed move — and they will not make this decision lightly — but the DOJ has an obligation to protect the access of the 54 million Americans with disabilities to public goods and services, which includes public websites. Fortunately, some online programmers are voluntarily choosing to make their online content accessible — notably, Hulu. Netflix has also started to caption its online library (though it had dragged its feet for years.) Others, such as TheWB.com, which is owned by Warner Bros., and Crackle.com, which is owned by Sony Pictures Entertainment, simply ignore captions altogether. They do this because they can. Once a cottage industry, emerging online formats now have the potential to lock the disabled population out of a huge marketplace of content unless new regulation or innovation — or a combination of both — spurs more businesses to embrace accessibility and its implications for future generation of Americans. Even if “The Annoying Orange” is a truly annoying show, shouldn’t people with disabilities be able to make that choice on their own? For more information, read my white paper on the issue of online video accessibility. Suzanne Robitaille is the founder of abledbody & co. and the author of “The Illustrated Guide to Assistive Technology & Devices.” Her company provides marketing and consulting services to organizations seeking to reach the disability community. Suzanne lost her hearing at age 4 and grew up profoundly deaf. In 2002 she received a cochlear implant, which she credits as “the ultimate assistive technology.” As a disability writer, Suzanne is a trusted source of disability information for The Wall Street Journal, ABC News, USA Today, HealthDay, Ability Magazine and more.